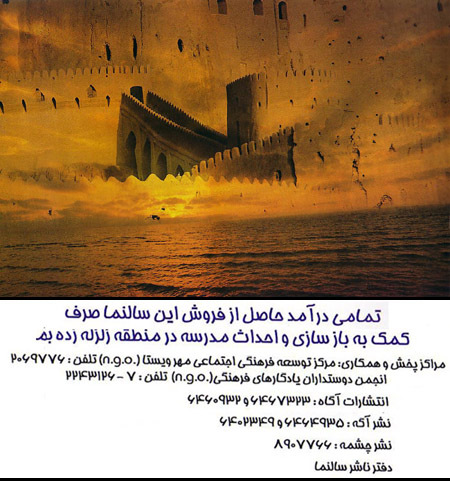 Mr. Nassrollah Kasraian, the famous Iranian photographer, has produced a Persian calendar for the next Iranian year (1383). The calendar is being sold in major bookstores in Tehran, and all proceeds will go through an NGO that I'm involved in towards rehabilitation of schools in quake-stricken areas in Bam and Jiroft. There are 12 pictures in the calendar, 8 from the historic Arg-e Bam and 4 from Kavir Lout. You can help the quake victims by ordering these calendars through your relatives. To order large quantities, please contact Syma Sayyah directly. This is a very good way for companies to help the quake survivors. One company has placed an order for 10,000 calendars and they will distribute it among their representatives in Iran. They also ordered a 2004 calendar with the same pictures.